Apple news alternative&semi; for your online magazine. Your branded News app available on Google Play and App Store. All the features you need to build your brand awareness on mobile. Activate Google mobile ads channel. Increase readership and retention. 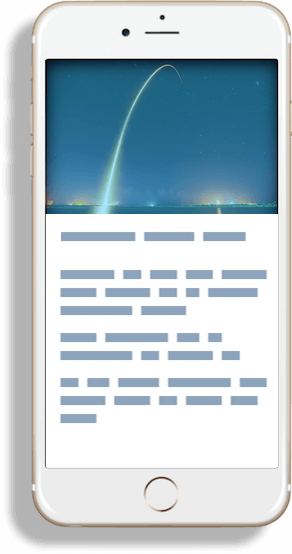 Distribute your web magazine content in a mobile adjusted form. Connect your blog. Let your existing content work, better. Make sure that with every new post being published on your blog, people get notified automatically about it. No matter whether they use Android or iOS mobile device. Create better content knowing who’s reading what thanks to in-app analytics. A XXI century communication layer enables you to engage your audience, better. Emails are so 90s. Communicate with mobile users the way they see your message naturally on their mobile device. Having branded app for your WordPress blog is a great addition to your Search Engine Optimization efforts. Let people google you easier thanks to being available on App Store and Google Play. Make sure that people will be able to read your content in flight mode or even if your blog is during technical maintenance or when experiencing servers outage. PressPad News let your readers access your content anytime, anywhere. A simple way to get your branded news app on the most popular app stores. Showcase your blog’s content, beautifully with your own iPhone/iPad and Android compatible mobile app.